King of the Franks and emperor of the West; born April, 742; died Jan. 28, 814. His attitude toward the Jews was rather that of a clever politician than of a liberal-minded man. He realized the advantages to be derived by the country from the business abilities of the Jews, and gave them complete freedom with regard to their commercial transactions. Some Jews seem to have occupied prominent places at his court. Thus, Charlemagne had for his physician one named Ferragut. A Hebrew named Isaac was a member of an embassy sent by Charlemagne to Harun al-Rashid, probably in the capacity of dragoman. The account which connects Charlemagne with the coming of Makir to Narbonne is apocryphal. But if the Jews were free in their commercial dealings, their political status generally remained almost the same under Charlemagne as under his predecessors. This is seen in his capitularies, some of which deal directly with the Jews. In bringing a charge against a Christian, the Jew was to have four, nine, or seven witnesses, while the Christian was held only to three. No Jew was to engage a Christian workman on a Sunday, nor was he to take in pledge, at the risk of the loss of his property and his right hand, anything that was the property of the Church. 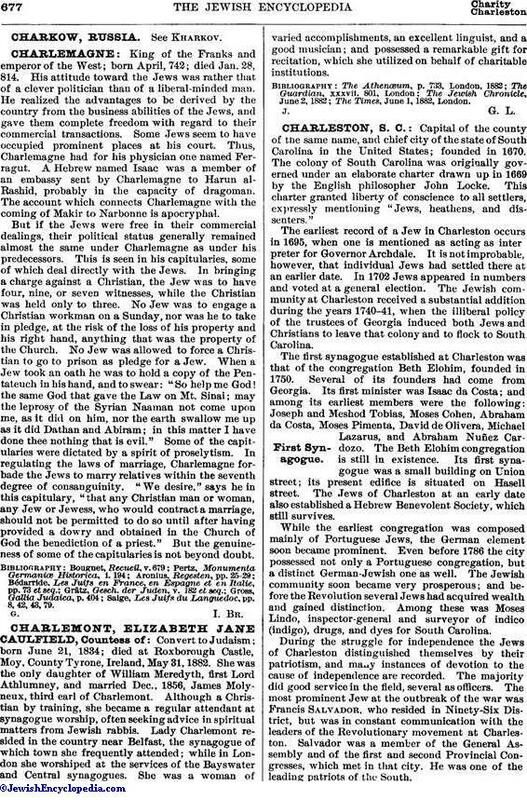 No Jew was allowed to force a Christian to go to prison as pledge for a Jew. When a Jew took an oath he was to hold a copy of the Pentateuch in his hand, and to swear: "So help me God! the same God that gave the Law on Mt. Sinai; may the leprosy of the Syrian Naaman not come upon me, as it did on him, nor the earth swallow me up as it did Dathan and Abiram; in this matter I have done thee nothing that is evil." Some of the capitularies were dictated by a spirit of proselytism. In regulating the laws of marriage, Charlemagne forbade the Jews to marry relatives within the seventh degree of consanguinity. "We desire," says he in this capitulary, "that any Christian man or woman, any Jew or Jewess, who would contract a marriage, should not be permitted to do so until after having provided a dowry and obtained in the Church of God the benediction of a priest." But the genuineness of some of the capitularies is not beyond doubt. Saige, Les Juifs du Languedoc, pp. 8, 42, 43, 79.